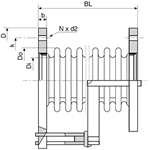 The correct application of metal bellows often involves custom work. Besides the standard range we therefore supply bellows designed for your application such as exhaust gas bellows to a DN6000, high pressure bellows with 20 layers and 250 bar working pressure, etc. Standard materials such as stainless steel or carbon steel are not always sufficient. For highly aggressive substances it may be necessary to make use of nickel alloys such as monel, incoloy, inconel or Halstelloy-C. The standard range includes different kinds of metal bellows depending on their movement absorption. There are axial, lateral and hinging bellows, with or without tie rods, hinge or universal constructions. Our technical specialists are always ready to advise you. High temperatures possibly combined with high pressures, such as steam, thermal oil, hot water, chemicals, etc. and safety. Where the standard bellows have a working life of 1,000 cycles, the HP bellows are designed for at least 2,000 cycles. RX®-HP bellows are multi-layer hydraulic-formed bellows specially designed to eliminate movements in piping where high requirements are made of working life and safety. Where the standard bellows have a working life of 1000 cycles, the HP bellows are designed for at least 2000 cycles. With the hydraulic movement of the bellows large movement absorptions and small fitting lengths become possible. The multi-layer bellows construction guarantees a high rate of flexibility by its high waveform and low spring constant. Where the standard bellows have a working life of 1000 cycles, the HP bellows are designed for at least 2000 cycles. 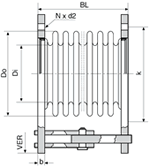 With the hydraulic movement of the bellows large movement absorptions and small fitting lengths become possible. The multi-layer bellows construction guarantees a high rate of flexibility by its high waveform and low spring constant. fitting lengths become possible. The multi-layer bellows construction guarantees a high rate of flexibility by its high waveform and low spring constant. The RX®-HP bellows are particularly suitable for the absorption of large movements, vibrations and high pressures. The multi-layer bellows construction guarantees a high rate of flexibility by its high waveform and low spring constant. The RX®-HP bellows are particularly suitable for the absorption of large movements, vibrations and high pressures. Hot air, gases, vapours, etc.